Our package is dedicated to those who have ample time in hand to enjoy a trip within the state. This package has been designed keeping in mind the precise requirements of our clients looking forward to spend an entire day in the ancient city. The service has been designed to suit a number of local tour purposes including sightseeing, attending meetings, shopping, seminars, visiting hospitals, and a lot more. If you have less time in hand, our half day hire service will help you enjoy the tour. The service has been designed in a fashion to cater to local city tour within a specified time span. Some of the most popular services under this category include Airport Transfer in Hampi, Car rental service for Marriage, party and event, Corporate Cab Rental in Hampi, Railway Transfer, visiting hospitals and a lot more. Looking for outstation travel packages? We have an exclusive offer for you to ensure excellent trip experience with friends, best of excursions, enjoyable weekend getaways, and family leisure trip outside the city limits. This is a dedicated to and fro taxi facility offered by our team to Hampi visitors. It is available for various destinations from Hampi. 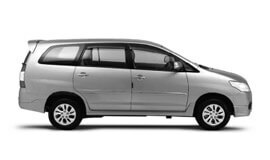 Our one way drop hire service will help you enjoy premium quality taxi service to your desired destinations starting from Hampi. If visiting multiple destinations from Hampi is on your agenda, we will help you do just that without having to face much hassle. The multi city tours have been planned for a fixed period time. This is a tour and taxi package designed just for you. Here, we, listen to your precise needs and budget before crafting a package for you. We guarantee the best car rental services in Hampi at highly affordable prices. Hampi’s climate is generally dry & hot. The season extends from the month of March to early June is the summer. Monsoon brings some wet weather that lasts from late June to early August. The colder period of the year is from November to February. As per official census report for the year 2011, Hampi has a population of 10000 residents. Presence of a number of mineral deposits in this region such as iron-ore, manganese has made mining as one of the major businesses for many years now. Tourism is another major business in Hampi. Hampi is a beautiful ancient town of Hampi which is visited by thousands of tourists from all across the globe. Some of the best places to visit here include Hampi Bazaar located near the Virupaksha Temple, Matanga Hill, Achyutaraya temple, Tungabhadra River, the Kodanda Rama temple, the Veerbhadra temple, Turthu canal, Daroji Sloth Bear Sanctuary, Vithala Temple Complex, Hazara Rama Temple, Lakshmi Narasimha Temple, Virupaksha Temple, Elephant Stables, Archaeological Museum at Kamalapura, Chandramauleshwar Temple, Yentrodharaka Anjaneya temple, Anegondi, Uddana Veerabhadra temple, Tungabhadra River, The Underground Temple, Aqueducts and Canals, Badava Linga, Akka Tangi Gudda, Ugra Narasimha, The King's balance, Virupapura, Zenana enclosure, Vittala temple, Yeduru Basavanna, Anjeyanadri Hill, Madhavan Palace, Lotus temple, and Elephant stables.